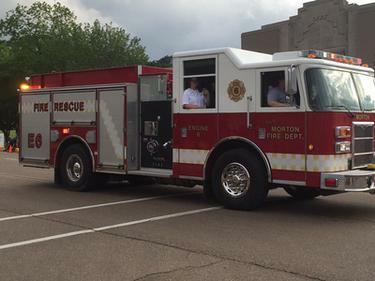 The Morton Fire Department, which consists of one paramedic, three EMT’s, four EMR’s, and twelve fire rescue personnel, takes much pride in serving the citizens of Morton and the surrounding area. The Morton Fire Department provides fire and EMS services which cover approximately 110 square miles and includes 10 miles of interstate. In addition to firefighting, the fire department also provides rescue and motor vehicle extrication and medical treatment of patients. The fire apparatus of the Morton Fire Department consists of a new 2002 model American Lafrance pumper/tanker, which has the capabilities of hauling 2000 gallons of water and pumping 1500 gallons per minute. Other vehicles include a 2008 Pierce Contender Fire Truck. Thanks to the hard work of each member, the Morton Fire Department is dedicated to saving lives and property for the citizens of Morton.